We always love to photograph events at Cabo del Sol, especially when they are luxurious weddings designed by destination wedding planner Vari at Los Cabos' Allure Events! For this Cabo wedding, a giant tent was installed on the grassy lawn overlooking the Sea of Cortes. While most couples will have their wedding reception at the hacienda-style Cabo del Sol golf club house, this Mexican-Canadian couple wanted their entire wedding to be outdoors so they could feel the ocean breeze and hear the ocean waves crashing on the shore. The resulting open air tent with flowing fabric draping, a wooden dance floor, sparkling overhead bistro lights and hundreds and hundreds of candles created the most romantic mood we have yet seen at a Cabo del Sol wedding for the 250 guests from across Canada, the USA and Mexico. 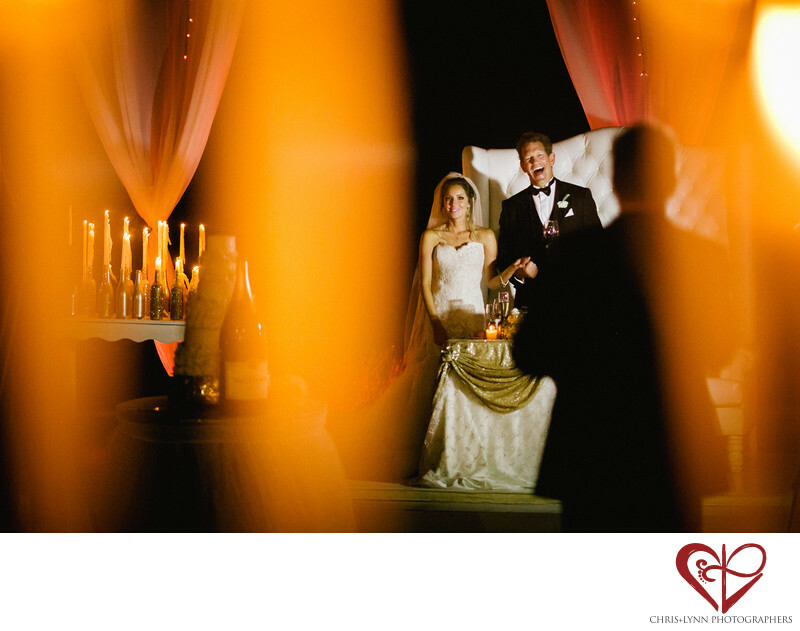 This creative photojournalistic image of the best man's speech was photographed through one of the many large candelabras surrounding the reception area, giving the image its warm glow and framing the bride and groom. The silhouette of the best man leads the eye to the groom's expressive reaction to his speech & raised glass. Location: Carretera Transpeninsular km 10.3, Cabo del Sol, 23410 Cabo San Lucas, BCS, Mexico. 1/640; f/2.0; ISO 3200; 135.0 mm.